My only wish few months ago was to apply to manage a Pancious franchise for Bandung. Equipped well with the insights of how wonderfully this business will run in Bandung and disappointed utterly with the appearance of this similar concept due to the lack of fund! Fresh from the oven. Lo and behold! The Nanny’s Pavillon in Bandung!!! This place offers almost the same as Pancious but with a friendlier price of course (the one in Jakarta is more expensive). Since it has become one of the hippest place in town, on and on it’s crowded like almost everyday. Located in a fine premise, very strategic, integrated with a boutique outlet and a food court, Nanny’s Pavillon boastfully presents its existence. The name ‘Pavillon’ was indeed French but since it’s using Nanny’s than it’s a bit strange actually but does the knowledge of proper English matters here? What matters is indeed what this Nanny may offer us! It was indeed literally located in a pavilion, the open air design will give you a more fresh kind of feeling if you compare it to other air-conditioned pancake parlors in Jakarta. They also cover the place with plants and making it feels like home because in reality it’s located just beside the busy street of Riau/Martadinata St. The problem would be where to park your car because they don’t provide enough parking space inside so most likely you gonna need to park your car outside and if you happen to be unlucky in a situation where you’re really craving of pancake at a wrong time (i.e : weekends), then you might gonna need to walk a bit from where you park your car. Luckily, for those who use public transportation, you can stop the angkot just outside the place. Very convenient, but judging from how Indonesians now prefer to flood the street with motorcycles and the fact that Bandung is lacking of parking lots, you gotta do what you gotta do then. That time, the air was still in the atmosphere of Lebaran holiday but it was the remaining days of it so many people already got back to work. We assumed that even Jakartans already return back to their bustling city, so we decided to have a lunch there. It was a misjudge, lucky for us that we had arrived earlier for the waiting list because less than 5 minutes later, tons of people flooded the waiting list right away. We’re welcomed by waitresses dressed like French maids in green stripes clothes. The Nanny thing also applied to the theme of the place, like the interiors, the benches, and the whole design. It is very fitting with the pancake, I’d say. When we browsed the menu, they also served pasta, sandwich, baked rice and coffee. Since my mom wanted a pancake, then I should pick something else. I suggested her the Peach Pancake (IDR 29,000) and I picked myself a pasta dish of Beef Fettucines with Brown Sauce (IDR 29,000). For a price comparison, the pancake was in the same tier with Pancious but the pasta surely cheaper. You gonna get around IDR 40K in Pancious for the pasta. 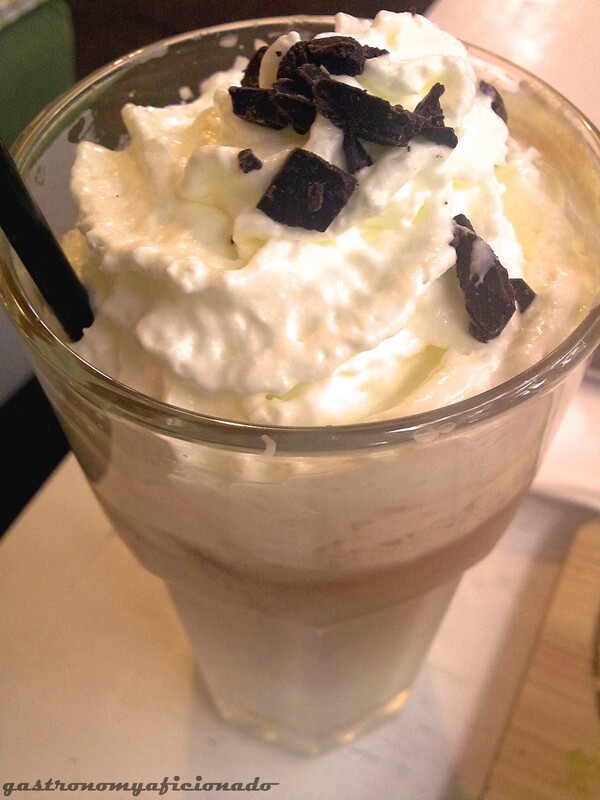 For the drink, I picked the Auntie’s Butterscotch Coffee (IDR 18,000). I took the liberty to change the name from Aunt Butterscotch coz I forgot the Aunt’s name. Hahaha.. So, the peach pancake was great! 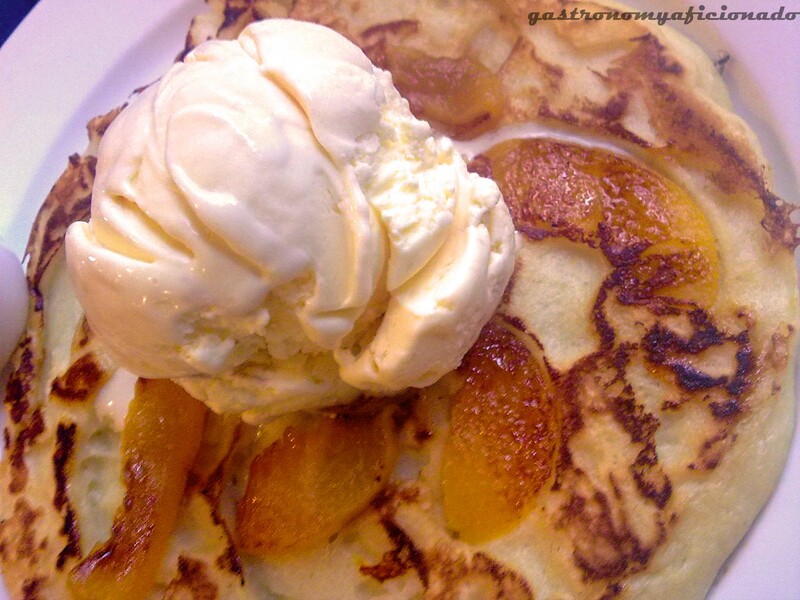 It was big, warm, tender, it got peaches in it (the one in Pancious was different, they simply ‘pour’ the peaches with the sauce on top of the pancake), plus really fits well with the vanilla ice cream (too bad Nanny hasn’t provided other flavors besides vanilla that time). They also provide the maple syrup, which was a very important thing you can add to a pancake! As for the pasta, it was quite okay. You may see it like small portion at first, but when you dig it, it’s quite deep. 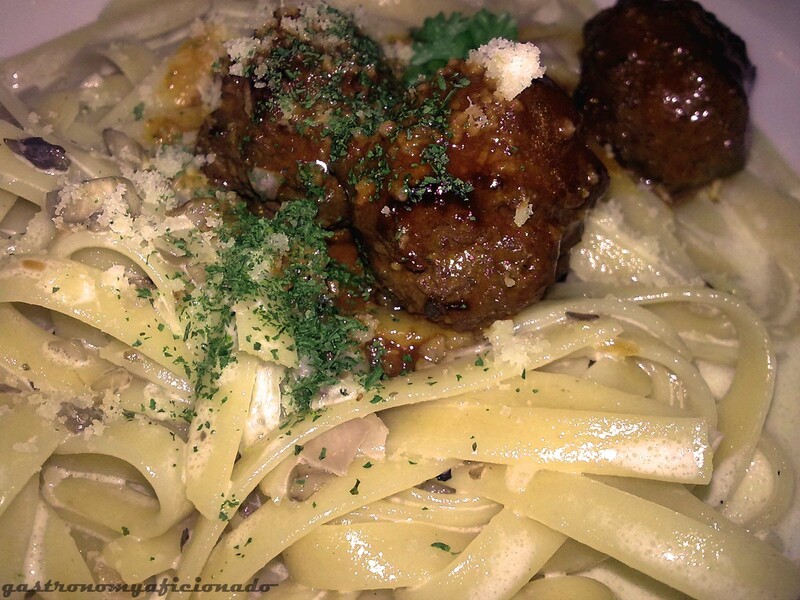 Perhaps it’s lacking in composition whereas they put only few meatballs to balance the portion and the sauce. Plus it lacked of herbs. European dishes use plenty of grassy herbs like oregano, rosemary, and friends. Luckily they provided parmesan cheese (unlike the stingy Pizza Hut). To wrap it up, it was a decent lunch after all and people indeed seem to like the place and the food. I got no objection in that. Since Nanny’s Pavillon is the first and the most decent pancake parlor Bandung ever got. Sooner or later, competitors for the same genre will join in for the fight and as usual Bandung will become even more indisputable as a culinary haven. The price we gotta pay would only be the heavy traffic. Since Bandungnese are price-sensitive people. This place would accommodate their wallet and their appetite. Though the price tags in Jakarta are several thousand rupiah more expensive. Feels like home and far from the feeling that it’s located just beside a busy street. The waitresses are like French maids ready to serve you with good home dishes. Quite helpful but if it’s the rush hour, you might gonna get a bit difficulty asking for their prompt compliance. So far so good. I still need to work on the other menu there. The pioneer of pancake parlor in Bandung. They gonna need to improve every time so that they can compete with potential competitors sooner or later. As for the rest, I feel quite contented.